SpamGuard is our fully managed email protection service, eliminating up to 99% of unwanted email before it reaches a your network. 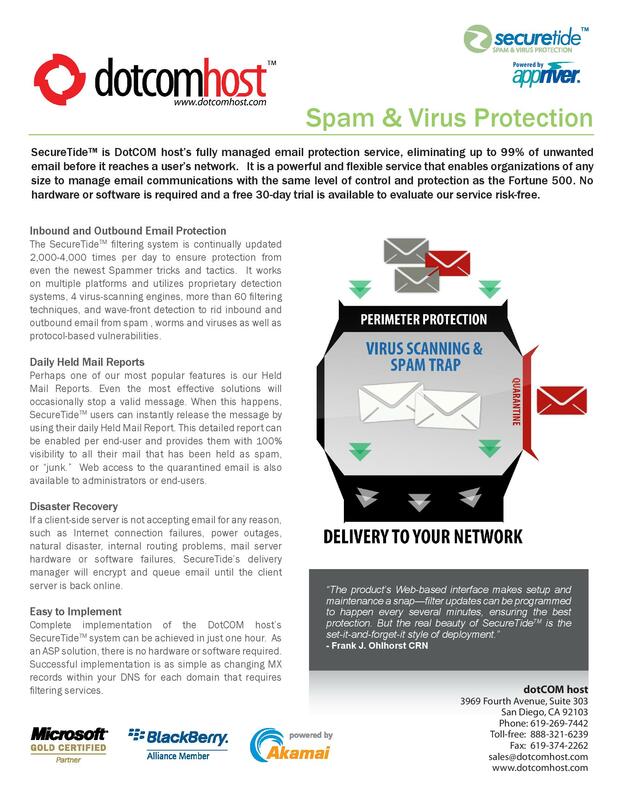 It is a powerful and flexible service that enables organizations of any size to manage email communications with the same level of control and protection as the Fortune 500. No hardware or software is required and a free 30-day trial is available to evaluate our service risk-free. The filtering system is continually updated 2,000-4,000 times per day to ensure protection from even the newest Spammer tricks and tactics. It works on multiple platforms and utilizes proprietary detection systems, 4 virus-scanning engines, more than 60 filtering techniques, and wave-front detection to rid inbound and outbound email from spam, worms and viruses as well as protocol-based vulnerabilities. Perhaps one of our most popular features is our Held Mail Reports. Even the most effective solutions will occasionally stop a valid message. When this happens users can instantly release the message by using their daily Held Mail Report. This detailed report can be enabled per end-user and provides them with 100% visibility to all their mail that has been held as spam, or “junk.” Web access to the quarantined email is also available to administrators or end-users. If a client-side server is not accepting email for any reason, such as Internet connection failures, power outages, natural disaster, internal routing problems, mail server hardware or software failures, the delivery manager will encrypt and queue email until the client server is back online. Complete implementation can be achieved in just one hour. As SaaS solution ,there is no hardware or software required. Successful implementation is as simple as changing MX records within your DNS for each domain that requires filtering.